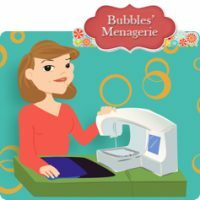 SewBubbles Membership Area – it’s FREE! Well, many of you already know that there have been some changes to my website – and this is just the beginning! I appreciate your patience while I work through the changes – I guess this is what they call growing pains. I seem to have figured out the newsletter bit – the first webinar on an Introduction to Embrilliance Essentials definitely kicked my tail into gear in getting that moving forward! I have posted the replay for this webinar in the members area on my website. 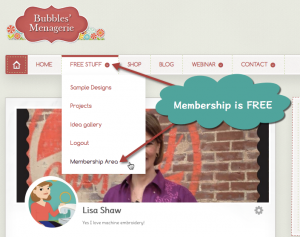 Membership is free and you can create or login from the Free Stuff menu. Why did I create a membership area? I’m always working on something and this is just step 1 on how I can provide information in a controlled environment. We are machine embroider-ers – think of this as underlay. When you are logged into the membership area, your Free Stuff menu will NOT show a login as the picture shows on the left. So if you click on Login for Member’s Area, you are asked to either Login or to Register. I tried to list simple instructions, so hopefully it doesn’t cause too much confusion. Once you are logged in, your Free Stuff menu changes. You will see the Logout option and at the bottom you will see the Member’s Area. Selecting this option takes you to the page where I have posted various files, information & resources just for those that have registered. Since membership is free, if you see something that you think your friends might like, please direct them to my website to sign up and get the free goodies that I am giving to those that are members. Yes, the content I am giving is free, but the key point is that I am the one giving the content. Please do not share the files or links to videos or free designs – that is not nice or polite. You can share the link to this post or send them to my website to register and then they can get what it is that you found to be valuable. Thanks for understanding! 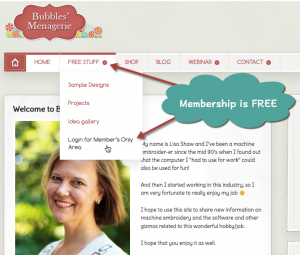 So, I mentioned that the webinar replay is now available in the membership area! YES, you will see the link and information right at the top of the page. If you are new to Embrilliance and want to get a quick demonstration about what you can do with Essentials, this video will give you a feel as to how the software works and what you can do with it. I think Essentials is a tremendous program and opens up a whole world of possibilities for customizing existing designs. Thanks for spending some time with me today! Enjoy the member’s area and watch for exciting changes on my website!